The following is an expanded version of the talk given by Steve Byrne at the Interwinery Analysis Group seminar in Adelaide on Friday 1 August 2014. The topic presented was ‘Advances in Ebulliometry and Tips for Improving Precision’. Ebulliometers have been used for measuring the alcoholic content of wine since the late-1800s. The traditional manual model is still in production and newer electronic versions are now also available. -look cool and are fun to use! More detailed discussion on how to use ebulliometers and other ways of measuring alcohol have been published in this journal previously (1,2). The focus of this article is on the main drawback of using an ebulliometer and that is the accuracy. And this, of course, can be quite a disadvantage for such an important parameter. 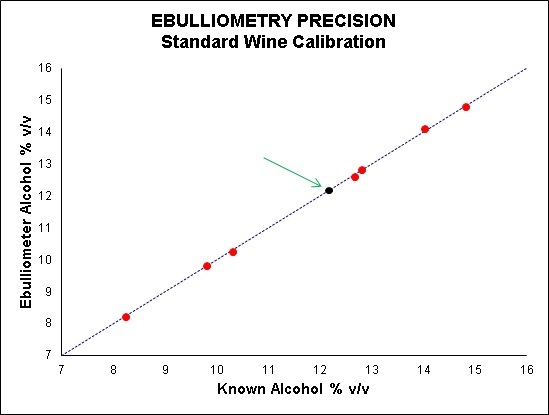 Measuring alcohol (ethanol) in wine by Ebulliometry is not an officially recognised technique by either the International Organisation of Vine and Wine (OIV) or AOAC International. These international bodies are sources of official test methods and although they have other techniques for determining alcohol in wine, ebulliometry is not one of them. We can only assume this is because of the accuracy of the ebulliometric technique. An ebulliometer is a simple device for measuring the boiling point of a liquid. The derivation of the word ebulliometry is from Latin ebullire “to bubble up”. For pure liquids the accuracy is very good, however for non-pure liquids the determination is more complicated. This is because of the well-known colligative property of boiling point elevation in the presence of dissolved substances (solutes). Changes to the atmospheric pressure also affect the results and this must be taken into account as well. For a mixture of pure water and pure ethanol the proportion of alcohol can be found with good accuracy. However if dissolved substances such as organic acids and sugars are present (as in all wines) then a correction must be applied. For very dry wines the results can be good, however in the presence of high levels of sugars the boiling point of the solution is elevated and has to be corrected, and this can lead to unacceptable errors. 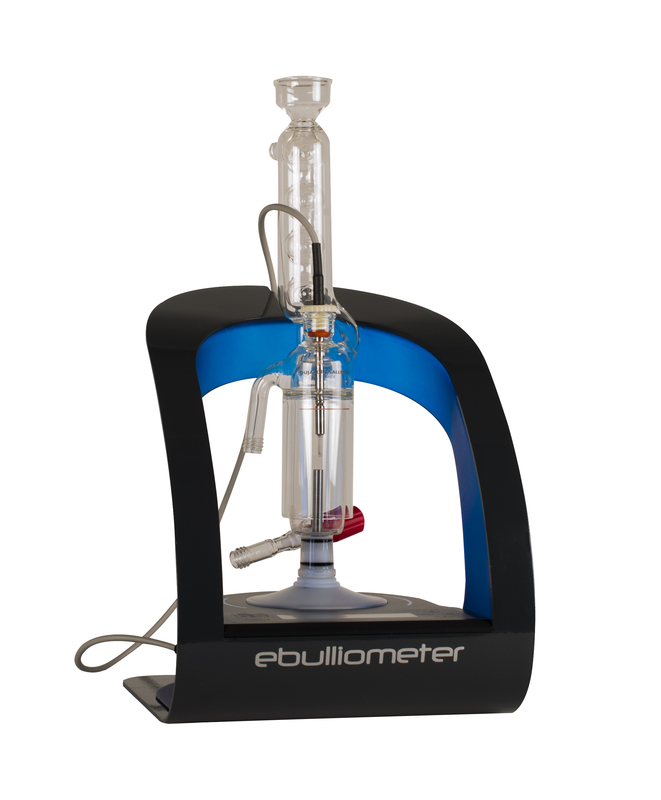 There are some ways that the accuracy of results from ebulliometers can be improved: before measuring the boiling point of your wine, you first need to ‘calibrate’ the ebulliometer by measuring the boiling point of a liquid of known alcohol concentration. Historically, distilled water has been used to calibrate the ebulliometer for the obvious benefit of it having a known alcohol concentration of 0%v/v. This however can lead to inaccuracies in your sample results as you are calibrating with a solution that has a far lower alcohol concentration than your samples and also has a matrix very different to your wines. 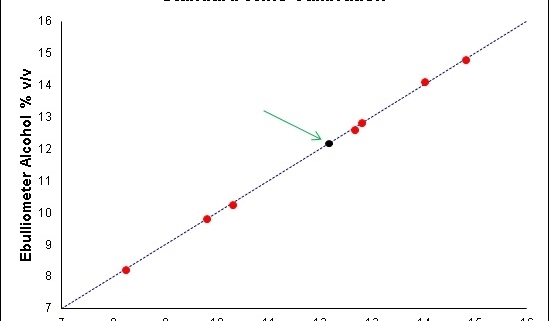 Trials have shown that when calibrating with distilled water, the higher the alcohol content of your wines, the greater is the error in the results (see Figure 3). For higher alcohol wines, precision can be improved by diluting the wine with distilled water, by say 1:1. This has a two pronged effect. First, it reduces the error associated with the presence of solutes in the sample as the impact is halved. Secondly, by lowering the alcohol you are measuring at a level that is closer to the calibration point of 0%v/v. Diluting your samples can have its own drawbacks though. Dilution errors can impact on the final result – the extent of the error depends on the level of accuracy of your volumetric glassware and the lab technician performing the dilution. So rather than calibrating the ebulliometer with distilled water, a better approach is to calibrate it with a stable wine sample of known alcohol concentration, otherwise known as a “standard wine”. This is best obtained from a NATA accredited laboratory. This standard wine will be much better matrix-matched to your samples and have an alcohol concentration closer to your samples, thus improving accuracy (see Figure 4). However they do require very good skills to correctly calibrate them daily. For the label alcohol statement we strongly recommend that you have the alcohol content of the wine analysed by an accredited laboratory, regardless of the technique you use in your winery laboratory. We have been performing Export Certification of wine in Australia since 1996 and have lost count of the times that we have received fully labelled and finished wines only for us to get an alcohol content that differs greatly from what is on the label. For the sake of paying an accredited lab around $20, it just isn’t worth doing the alcohol label statement yourself! 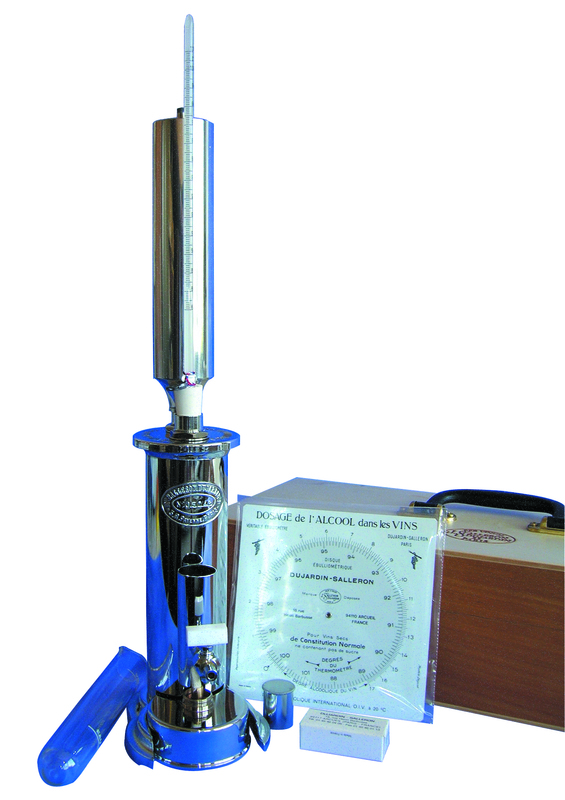 Ebulliometry is a technique that has been used for over 100 years for measuring the alcohol content of wine. There are some simple ways to improve the accuracy of this technique. There are also other more accurate ways to determine alcohol. It is strongly recommended that whatever technique you use, you get the label alcohol content determined by an accredited laboratory. Copyright© 2014 Vintessential Laboratories. No part of this publication may be reproduced in any form or by any means without the permission in writing from the copyright owner.